How big are these? Are they suitable children under 3s? Each counter is approximately 40mm. They are not suitable for children under the age of 3. 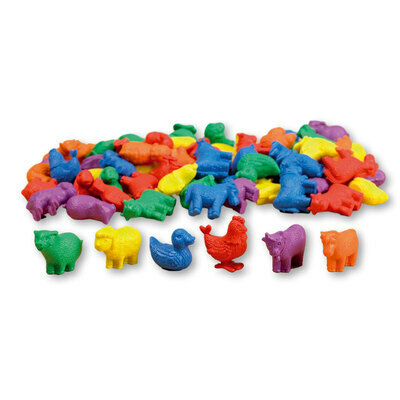 For educational environments, these Farm Animal Counters 72 Pack are a unique and engaging tool for many subjects. Made from a durable plastic, each of these 72 items have been expertly shaped into a detailed farm animal and colours in a bright pop of colour. These counters make an ideal tool for the teaching of counting, sorting, pattern creation and other simply mathematical processes including addition and subtraction. Pass these out within your class and challenge your pupils to find their matching pairs or colours. Alternatively, introduce these animal counters during maths class as a unique way of teaching the basic workings of algebra in everyday life. Introduce numerous options to your teaching and add our Transport Counters 72 Pk to your basket as well.